Are You Breaking the Rules for Outsourcing Branded Content? On June 29, 2012, WBEZ’s This American Life sparked a debate with no foreseen expiration date. Producer Sarah Keonig of WBEZ examined the relationship between the Chicago Tribune and its new content partner, Journatic. oenig also revealed that Journatic writers were using fake bylines to sound more American. The reaction to the story was not a positive one. 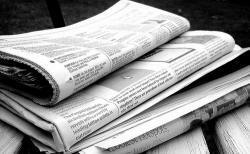 On July 13, the Chicago Tribune announced the suspension of Journatic services after uncovering plagiarism in a story. And on July 14, the head of editorial at Journatic resigned. As a result, other news organizations also decided to leave Journatic. But, the story doesn’t end there! On July 22, the Chicago Tribune published an article that discusses the ongoing struggle between large news organizations and quality hyper-local journalism. After five months of investigation into Journatic article quality, and debate both within the Tribune and media community at large, the Tribune recently announced its decision to resume working with Journatic. However, the Tribune will continue the partnership with renewed limitations, only using Journatic for informational pieces like listings. So the question remains – What are the universal standards for outsourcing content? The answer is simple. And complex. There aren’t any. In the spirit of traditional journalism, local news might not be the best place to outsource content. For many, local news is personal and emotionally meaningful. But what about business output? 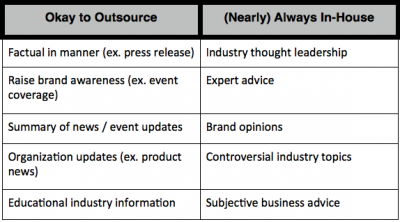 Following the above controversy, I decided to examine the nature of outsourcing in terms of business content. When Should Your Brand Outsource Content? “Content is king” has become something of a marketing mantra over the past few years. So, naturally, agencies and marketers alike are trying to find new ways to produce more content. Between Google algorithm updates and perceptions in the marketplace (such as seen in the Journatic controversy) some might be apprehensive to try outsourcing at all. But, if done right, outsourcing can be beneficial for your business in the long run. Before you outsource, define the ethical standards and business goals that are specific to your organization. In order to make a justified business decision, make two lists. The first will consist of content traits that you feel are prime for an outsourced team or writer. The other will list characteristics of content that must be written by in-house writers. Share these lists with all employees to stick to a uniform set of principles. When it comes to content, similar to the approach the Tribune took when it chose to re-engage with Journatic, it is key to analyze the purpose and nature of each piece before delegating items. There are times when it’s unnecessary (and maybe even risky) to outsource content. Define these lines for your business and maintain that standard as you experiment with outsourcing. If there is an intimate element to a topic, then it’s smart to give the content your own personal touch. But, if you must turn to outsourcing for business support—for example, if you don’t have the capabilities or resources in-house—you can outsource even intimate content, if you choose the right partner. If you are under-staffed or searching for writing talent, don’t settle quickly. The right agency or organization can partner with your business and, over time, become an extension of your team. A trusted partner spends time getting to know your business and your industry in order to write efficiently and ethically. During the discovery process, be transparent, share industry resources and make time for interviews. It’s key to know that your writers not only know your industry, but also identify with your brand. If you are able to find the right match, then outsourcing might look like a lot like insourcing. In any case of outsourcing, you still need to serve in an editor role to make sure the content meets your standards, conveys the right feelings/messages and also is technically sound. If you choose to outsource all company content, be sure that someone is acting as editorial head in order to review (and make personal additions to) all content. There’s no escaping the budget factors of outsourcing your content. If you decide to outsource, it’s important to analyze the relationship between price and quality. Generic writing from a stable of content farm freelancers might be cheaper, but is it really better? Productivity and quality are key. High quality articles will make a stronger impact on prospective and existing customers, giving them a reason to come back. Plus, readers often share great articles they love with followers on social media, resulting in an added SEO boost. However, if content quality is low or obviously rushed, Google may purposefully penalize your site. Analyze the balance between content quality and quantity before allocating resources to an outsourced writer. A well-populated, resourceful website is great; one that brings value with each article and asset is better. Strive to do both—with or without outsourcing. How do you tackle content creation for your organization? Have you ever been burned by outsourcing? We’d love to hear the community’s thoughts on this important topic.